All wood types are shown as unfinished. These images of wood types represent a general view of the wood type. The exact wood will vary slightly. Hidden Doors are built standard with a magnetic catch (In-Swing Style) or a friction catch latch (Out-Swing Style). They are indended to secure the door in place when closed, however, they do not lock the door. Electronic locking mechanism that uses a magnet to keep the door closed. 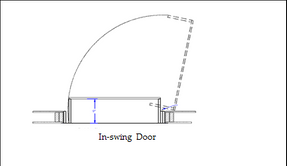 Compatible for In-Swing and Out-Swing Style doors. Most popular locking mechanism. Requires a magnetic key to unlock the door. A manual lock using a slide bolt hidden behind the frame of the hidden door. Ball Bearing hinges are used for In-Swing Style hidden doors. These hinges are durable, better performing and less noisy than standard hinges. A hidden door with ball bearing hinges opens to approx 130 degrees. 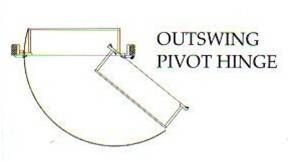 Pivot hinges are used for Out-Swing Style hidden doors. They are durable and can withstand heavy loads. A hidden door with pivot hinges opens to approx 130 degrees. SOSS hinges are primarily used for narrow Out-Swing Style hidden doors that are typically less than 30" width. SOSS hinges allow the hidden door to open up to 180 degrees. 4" Toe Kick threshold is standard with all hidden door builds. 3/4" Rounded Toe Kick is an ideal option for Out-Swing Style doors. This is a good option if you are concerned about stepping over a 4" threshold. No Fixed Toe Kick option is available for In-Swing Style hidden doors only. This as a good option if you are concerned about stepping over a 4" threshold. 4.5" depth is our standard depth and ideal for small photos, paperback books, trinkets, etc. 8.5" depth is our standard depth and most common. This depth is ideal for standard 8.5"x11" books, photos, smaller books, etc. We also offer an extra depth for our customers looking for deeper shelf space. All items listed above are our most commons offerings and requests. All doors are custom build so if you have an idea for your custom application and it is not included above please add your comments in the Request a Quote page.